as well as updates on major legislation. Equal pay was also mentioned several times at this year’s Democratic National Convention (DNC), with a focus on providing equal compensation for men and women doing the same work. DNC speakers mentioned the Lilly Ledbetter Fair Pay Act, the first bill President Obama signed into law. The bipartisan bill extended the time period to bring pay discrimination claims. There are several bills this Congress that focus on closing the gender wage gap. Learn more. Many DNC speakers called for student debt reform. Last year, Congress passed a two-year extension of the Perkins loan program, which allows undergraduate students to obtain student loans on per need basis. Free college tuition was mentioned by several speakers, a policy promoted by Sen. Bernie Sanders [I, VT] who introduced the College for All Act. Many in the DNC this week held signs referencing the TPP, the Trans-Pacific Partnership, a trade agreement between twelve Pacific Rim countries that was finalized earlier this year. Presidential advisors are encouraging Congress to approve the deal during the lame-duck session after the November election. Several Congressional leaders, including Senate Majority Leader Mitch McConnell and Minority Leader Harry Reid have said it is unlikely. What do you think? Many speakers mentioned gun-related legislation. Following the Orlando shooting, there have been several bipartisan efforts to introduce, debate, and vote on gun-related legislation, such as increasing background checks, denying firearms to those on the terrorist watchlist, and closing the “gun show loophole.” To draw attention to the issue, Democratic Senators held the floor for 15 hours in a filibuster in mid-June, and House Democrats held a 25-hour sit-in on the chamber floor a week later. Catch up on what’s been happening. The hacking and release of 19,000+ DNC emails was mentioned several times at the convention. In response, bipartisan Senate Judiciary leaders asked Attorney General Loretta Lynch and FBI Director James Comey for more details surrounding the hack. Meanwhile, top Democrats on House and Senate Intelligence called for the release of classified reports on the DNC hack. What's happening with the energy bill? 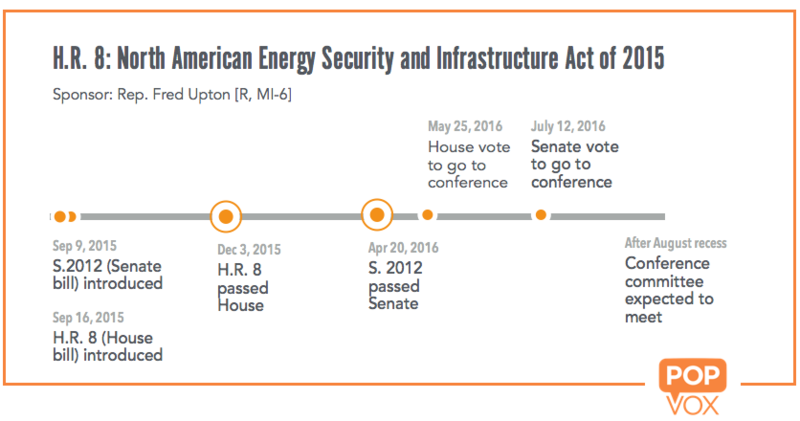 Before adjourning for seven week recess, the House and Senate agreed to convene a conference committee on major energy legislation introduced last September. The last time the two chambers convened a formal conference to negotiate major energy bill was 2005. Senate version covers five main areas: efficiency, infrastructure, supply, accountability, and conservation reauthorization. The Obama administration praised parts of the bill but has voiced concerns over how to implement some of the provisions. Senate passed bill in April by vote of 85-12. See how your Senators voted. House version is narrower and received a veto threat from the White House. The "engrossed House amendment" includes several passed bills put up by House Natural Resources, House Energy and Commerce, House Transportation and Infrastructure, and House Agriculture. This means House replaced Senate version with its own version. House passed bill largely along party lines, by vote of 241-148. See how your Representative voted. So now, Members head to conference to reconcile differences between their respective versions of legislation. Going to conference is one of the final steps of "regular order" in the legislative process — when House and Senate appoint conferees to meet and work out differences in different versions of similar bills that passed both chambers. According to U.S. Constitution, chambers must pass identical legislation for the bill to leave Congress and be signed by the President. European Union data protection authorities said they would accept data-transfer pact (aka Privacy Shield) for one year until both sides conduct their first review of the new framework. New Government Accountability Office (GAO) report recommends simplifying grant making process for universities. Report requested by House Science, Space and Technology. Missouri Supreme Court overturned law that capped unemployment benefits for laid-off workers at 13 weeks. The law was approved by the legislature and vetoed by Gov. Jay Nixon [D]. Although the House overrode the veto in spring, the Senate did not act on the veto override until September. The Court held that the Senate waited too long to act and allowing the veto override to stand would violate the state’s constitution. North Carolina Gov. Pat McCrory [R] signed several bills into law this week. One bill creates a statewide district of five underperforming schools, to be turned over to charter school management companies. Arizona became the last state to ensure that all low-income children receive health insurance. Under the new program, children whose parents make too much to receive Medicaid but still do not have health insurance will be covered. Pennsylvania legislature adjourned this week without voting on several high-profile bills regarding pension reform, updates to statute of limitations on child sexual abuse cases, abortion restrictions, and anti-discrimination protections. When lawmakers return in September, they will have until November 30 to vote on these bills. Georgia Court of Appeals ruled that a man who recorded videos up a woman’s skirt did not violate the state’s privacy laws. Illinois Gov. Bruce Rauner [R] signed the Citizen Privacy Protection Act into law this week. The legislation would require law enforcement officers to gain court approval for using cell-site simulators (aka stingrays) which can locate and track a person’s cell phone without their knowledge. Virginia Supreme Court ruled that Gov. Terry McAuliffe’s executive order to restore voting rights to over 200,000 felons exceeded his clemency powers and violated the state constitution. Court held that the governor could only restore voting rights on a case-by-case basis. In response, Gov. McAuliffe [D] said he will sign 200,000 individual restoration orders. US Court of Appeals for the Fourth Circuit struck down North Carolina's voter ID law. The three-judge panel remarked that upholding the law would overlook the "inextricable link between race and politics" in the state. New Jersey Gov. Chris Christie [R] said he would not sign a Democratic proposal to increase the state’s gas tax in exchange for tax reforms, such as eliminating the estate tax, reducing taxes on retirement funds, increasing the Earned Income Tax, and providing new tax breaks for veterans and commuters. Alaska Supreme Court invalidated a state law requiring pregnant minors to obtain parental consent before receiving an abortion. Federal Communications Commission Chairman Tom Wheeler urged U.S. phone companies to develop technology that blocks automated robocalls and then make such tech available to customers at no cost. Sens. Thune and Markey recently called for end to robocalls as well. 32 House Democrats called on Centers for Medicare and Medicaid Services to strengthen proposed regulations for nursing homes. Consumer Financial Protection Bureau released framework to regulate debt-collection practices. Plan marks first overhaul of federal oversight of the debt-collection market in four decades. Labor Department found Senate Food Services contractors broke the law — workers illegally denied $1M will receive back pay. FDA is seeking public comment regarding deferral recommendations for gay men seeking to donate blood. Following the Orlando shooting, 130+ lawmakers urged the Food and Drug Administration to revise the policy. Sen. Chuck Grassley [R, IA] sent a letter to Medicare's top administrator, inquiring if Medicare drug plan is vulnerable to exploitation. Letter follows Associated Press report that spending for high-cost drugs has jumped by 85% in 3 years. Folks are still talking about House v. Burwell, as Obama administration appeals legal setback to Obamacare exchanges. 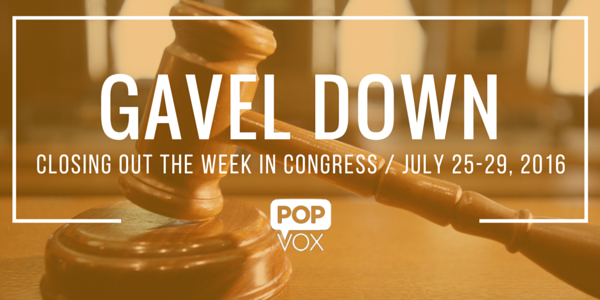 Catch up on the case, also the subject of a recent report from House Republicans that concluded Obama administration knowingly made payments without congressional appropriation, which is illegal. White House is reconsidering its ban prohibiting police departments from obtaining military-grade equipment. Centers for Medicare & Medicare Services unveiled star-based rating system for hospitals, first overall hospital quality rating released by the federal government. Reps. Renacci [R, OH-16] and Rice [D, NY-4] introduced legislation to delay the ratings until 2017 and to require a 60-day comment period on the ratings' data and methodology. Search nearby hospitals. U.S. intelligence agencies have "high confidence" Russian government orchestrated theft of Democratic National Committee emails. House Oversight and Government Reform Committee Chairman Jason Chaffetz and Ranking Member Elijah Cummings wrote to 18 major departments asking for details about which events are too political for officials to attend, following slew of Hatch Act violations. Environmental Protection Agency and Department of Interior sparred over climate change before finalizing new oil and gas plan. Four individuals in Florida have been infected with Zika virus by local mosquitos, marking the first known cases of the virus being transmitted by mosquitoes in the continental U.S.
Senate Majority Whip John Cornyn published an op ed on Iran deal. FBI Director James Comey said government and tech still need to sort out differences over encryption. Sen. Marco Rubio [R, FL] sent a letter to President Obama urging the administration to spend funds to combat Zika virus more quickly. Six current and former Michigan state employees have been charged in widening criminal investigation into Flint Water Crisis. NFL announced new concussion policy, with neutral arbitrators who can only issue reports. Centers for Medicare and Medicaid Services proposed mandatory bundled payment program for patients who have heart attacks or undergo bypass surgery. Would help agency reach goal of having half of all Medicare payments linked to alternative payment models by 2018. Dept. of Interior announced it will launch "geofencing" program to alert drone pilots when they're flying too close to wildfire prevention operations. Health officials reported first baby born in NYC with Zika-related birth defect known as microcephaly, condition marked by an abnormally small head and impaired brain development. What’s going on with gun control legislation this year?